St James Hotel has strengthened its management team in order to support the company’s recent growth - with three more senior roles to be filled over the coming months. The hotel, based in Nottingham city centre, has promoted Christopher Harrison to general manager and hired Laura Snow as its new sales and marketing manager. 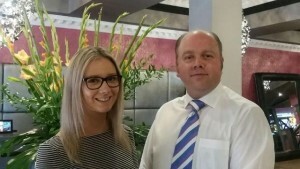 Mr Harrison, who has more than 20 years’ experience in the industry, having previously worked for Principal Hayley’s hotels and conference venues and Menzies Mickleover Court Hotel, joined St James as deputy general manager in 2014. He said: “During my interview for the role as deputy general manager, I remember saying how blown away I was by St James Hotel, how inspirational and forward thinking the hotel was. I also remember saying that I wanted to be a part of the very exciting journey the business was on. Miss Snow previously held roles at Youngs, Greenwich Inc, Best Western Plus Aston Hall Hotel, and most recently, Cockliffe Country House Hotel in Nottinghamshire. At St James, she will be responsible for driving sales and marketing activities across all areas of the business. St James Hotel is an independent boutique hotel with 87 bedrooms and a range of facilities including meeting and function rooms for conferences and civil ceremonies, lounge and bar, gym and art gallery. The venue, which employs around 40 staff, is also looking for a new operations manager, conference and banqueting operations manager and bar manager to join the team. Richard Johal, who has been the hotel’s general manager since 2013, has taken up the position of director.